RV camping should be a peaceful retreat from ordinary life. But if you wake up with back pain on every excursion, it’s time to get a new RV mattress. However, don’t begin your search until you follow these four (and money-saving) tips. When you`re in the market to get a new RV mattress, keep shopping around until you find the best one for you, your rig and wallet. Many smaller RVs are constructed around the sleeping quarters. Manufacturers put the mattress in place and then build the RV. Some RVers must cut a mattress in half to get it through the doorway and replace it with their only option, which is a foam mattress to fit inside. When you`re shopping to get a new RV mattress, it isn’t as easy as driving to the local furniture store. RV mattresses don’t have the same exact dimensions as domestic mattresses, even though manufacturers still label them “King” or “Queen” sizes. 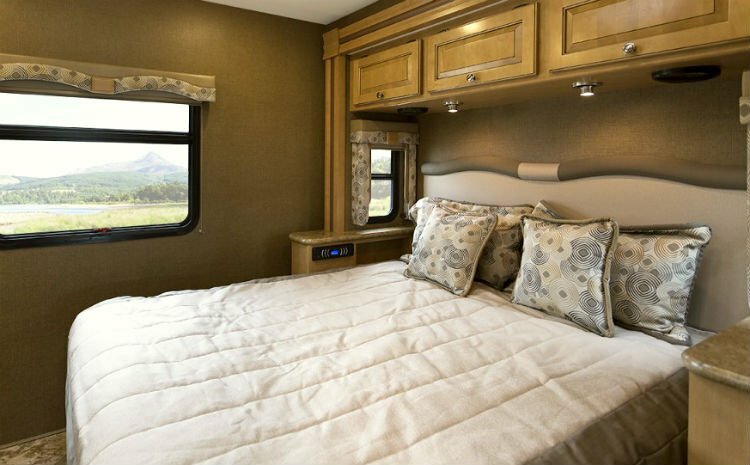 In addition, when you`re looking to get a new RV mattress, remember many RV bedrooms have a corner of the bed lopped off in order to accommodate interior shelves or doors. If your RV mattress needs to be an odd shape, you’ll spend even more time shopping around. Simply, measure the platform for the size, then measure the air space between the mattress and walls. RV Air Mattress: Two types of air mattresses for RVs exist. These include typical camping air mattress and costlier adjustable bed air mattress like those made for traditional homes. The first is a good choice for occasional RVers with strong backs. The second is a wise investment for full-time RVers. The drawbacks? Cost and altitude – you’ll need to adjust it for high altitudes. An air camping mattress sets you back less than $100. High end versions exceed $800. 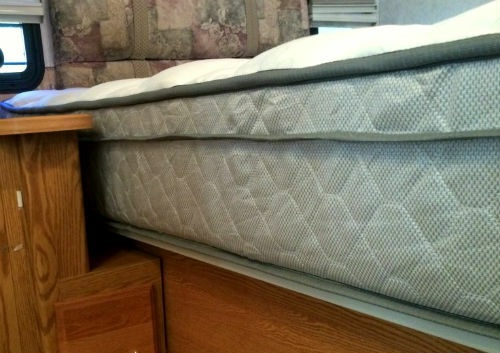 If cost is a major concern, don’t get a new RV mattress until you try some simple RV hacks. For instance, a futon mattress, foam RV mattress topper, a goose down feather bed topper or a new hi-density mattress topper, are all great temporary measures to get a better night’s sleep. In the meantime, keep shopping around until you find one the best RV mattress that works for your rig and wallet. Great information here! When you are on vacation you definitely don’t want a poor mattress. Finding something that works well in your RV is a must so you can enjoy yourself to the fullest! As you suggest, toppers are a good alternative to a complete mattress replacement. 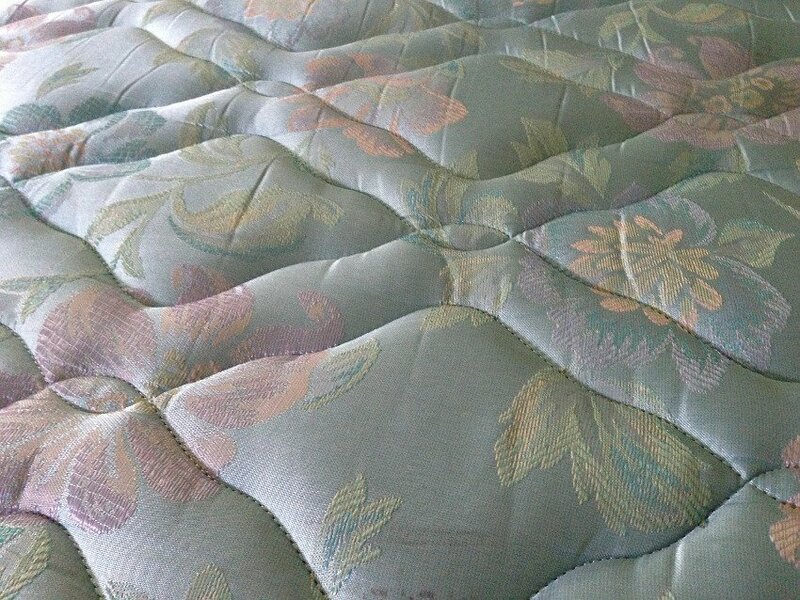 We completely transformed our RV mattress with a ViSpring Heaven Luxury Supreme topper. I found a mattress pad with gel. Found it at Lands End, but there may be other retailers. It made all the difference. Suggested it to a friend for her boat. She loved out too. Neither of us had to buy new mattresses. When I needed to replace the mattress in the house and having just gotten a new rv I put the same mattress in the rv that I had in the house. What a difference it makes having the same in both. There is no adjusting to sleeping on two different mattresses. Yes the rv has a standard size Queen. The only drawback is that because Winnebago has a higher platform in the 30T and the mattress is thicker than an rv one, I have to use a higher step stool to get in and of bed. The advantages of having the same mattress in both places out weights the minor issue of height in the rv. I put a 4″ memory foam topper on ours. Problem solved. Did it at home too! They work great! When we purchase a new truck camper we plan on purchasing a new mattress, that said, we will be going to Verlo mattress, they will customize the mattress for us. Very well written article Rene. You pointed out many important things regarding buying a mattress for RV – like the number 1 to consider is how one will swap the mattress with limited space inside and smaller doors. Also an important thing to consider, is as u mentioned in the article – the size of space for the mattress in RV and if there are any elements that might block the mattress. Had it happen to me, we bought a new mattress but forgot to first check if it would fit the camper and had to return it to get a different one, no big deal but that time could be spent camping, not going back and forth to the shop. With 2015 Winnebago View 24V, I have a flex bed (two twins with a filler in between to convert to a king). The gaps between the pads made it uncomfortable. Tried foam top and gel top but no luck. Recently bought a California King pillow topper from MyPillow and it was a perfect fit A small gap on driver’s side but it accommodates the cutout on that side. Not inexpensive (get the 30% off and two free pillows with code) but worth every penny! Sleep like at home now! I am converting a shuttle bus into an RV. I agree that my bed was the first priority. But I did not get a unique size (RV sized) mattress. I will be traveling by myself so I am installing a standard twin mattress. It backs up to the back of the bus so I have a wall to snuggle up to and still have room for my 2 cats to sleep with me. I did not purchase a box springs mattress bottom. The upper mattress is 12 inches deep (gel foam). I slept on it for a year at home to make sure it was comfortable; it is. We had a foam topper (cheap way)on our Queen and it keep shifting along with mattress when you lift the bed up to get in the compartment underneath. It only masked the problem of sore back. RV Mattresses that come with your rig are cheaply made unless you order a better quality one. We had gone to Mattress/Mattress and bought a new Queen firm pillow top one like we have in our house and so now we get a better night sleep. Our bed is at the front and we have a secondary door that made it easy to put it in. Engineered Sleep of Greenville SC. They will work with you to build the custom mattress that is right for you. They have all the various forms and will stack them to build the perfect mattress. You get to try before you buy. Then, see it built right there in their magic factory. It’s worth the trip to get it right the first time. You won’t be sorry. Very reasonable prices compared to mail-order. They will roll your old foam mattress on site for easy storage and you’re sleeping on your new mattress that night. BUT…My short queen bed mattress folds up into the ends of my Shamrock hybrid,,..I’m not so sure I can add a foam topper and get it to fold up easily, as well as losing the cozy heated mattress feature that I have now.. Maybe just a 2 inch foam topper might do..? My old Rockwood Roo had a full-size queen on each end..My new Shamrock shorted me! Being 6’6″ tall, I kinda miss the full queen on each end. where now, my feet and head press against the cold vinyl “tent” walls in cool weather….Other than a knit cap and wool socks, does anyone have a solution for me?? Our head of our bed raises so that is another consideration to include in your mattress search. Good Article! We have a memory foam replacement mattress and it improved comfort dramatically. I am concerned about the mildew warning. What is an air circulation liner and where can I find one? I purchased a queen-sized bed in a box for our replacement mattress. Made it super easy to install and it has made us happy sleepers. What is the typical size of a RV Twin mattress? We put a 3″ memory foam top on ours, Worst mistake ever. We felt like a bug stuck to a glue trap.